Anglo-Saxon features remaining, and the pre-conquest church. The original fabric was consecrated in 705 in the presence of King Ine and St.Aldhelm. In common with neighbouring churches at Wimborne and at Milborne Port, Sherborne has the peculiarity that the tower is wider in plan than any of the four arms of the building attached to it, so that the four angles of the tower stand free as salient angles, projecting beyond the walls of the adjoining nave, chancel, and transepts. This is not a feature normally found in Anglo-Norman churches, whereas it is found in exactly this form in a number of cruciform pre-conquest churches. There is, therefore, a strong presumption that the existing building at Sherborne either stands on the Anglo-Saxon foundations or, more probably, incorporates part of the original fabric. Further support for this alternative is given by the unusual shortness of the nave by comparison with other Norman churches and by the irregular spacing of the columns of the nave arcade. Sherborne falls within the class of an 'aisled transeptual' church, a rare survivor from Saxon days, albeit substantially rebuilt, but as we will see with important features remaining. A picture thus emerges of a 10th century monastic cathedral church with square western and central towers; a church of a total length not less than that of the present church, excluding its Lady Chapel, and with transepts and an aisled nave. Investigations carried out 1964 to 1973 have established the survival of the northern part of the north adjunct to the western tower, the main part of the west front and the north wall of north transept. The latter stands to gable height below the later Norman north wall. Surviving gables; importantly there is intact plaster on the east and north gables which indicate the pitch of the Anglo-Saxon roof. The north wall of the north annexe stands several feet high with its long-and-short north-east quoin intact for a height of 14 feet. The remainder of the west narthex and tower is attested by foundations. This well defined plan is in common with many other (larger) Anglo-Saxon churches. The western transept has been established as well as an upper western tower-sanctuary (Gibb 1975). It was usual for bells to be hung in western towers in Saxon times. (see also Hubert 1938: 80-5). They were, it seems, cast on site, so obviating the need to haul a heavy weight over some distance (see the casting pit at Barton-upon-Humber church). Indirect evidence for the former existence of a pre-conquest church of the same length as the present church was provided by the discovery about 1840 of a coffin of Purbeck marble below the flooring of the ambulatory near the east end. This is believed to be the coffin of King Ethelbert, brother and predecessor of King Alfred the Great. 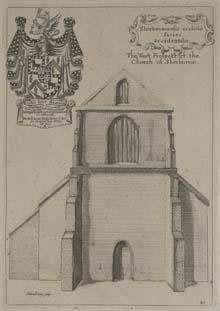 Their burial ‘behind the high altar’ at Sherborne was recorded by Leland. The burial of the two brothers at Sherborne is recorded in the ‘A’ version of the Anglo-Saxon Chronicle under the year of Ethelbald’s death, 860. The Anglo-Saxon archway (now a doorway) in the west wall of the nave north aisle has a later tympanum. Although this once blocked archway (which once led into the westwerken) has been severely defaced/remodelled, vestiges are extant of the original hood-moulding and also pilasters with stops, now in part reduced, cut back, flush with the west face of the wall (and seen from within the vestibule). When opened up in modern times (and converted to a doorway) it was protected from the weather by a small vestibule. The square jambs are cut straight through the wall and rest on chamfered bases, with quirked and chamfered imposts to support the stilted head. In all probabilty both faces would have been identical or very nearly so. The general character of the archway (with its typically non-radial voussoirs) would fit a date at the end of the 10th century, and, as the Benedictine rule was introduced at Sherborne in 998 by Bishop Wulsige, it is not improbable that it dates from building work (enlargement) of the church around that time. The medieval defacing has totally destroyed the character of this archway, radically weakened its aesthetic strength and negated its classical impact. Also the present floor level is higher than the original and this has altered the proportions of the archway. 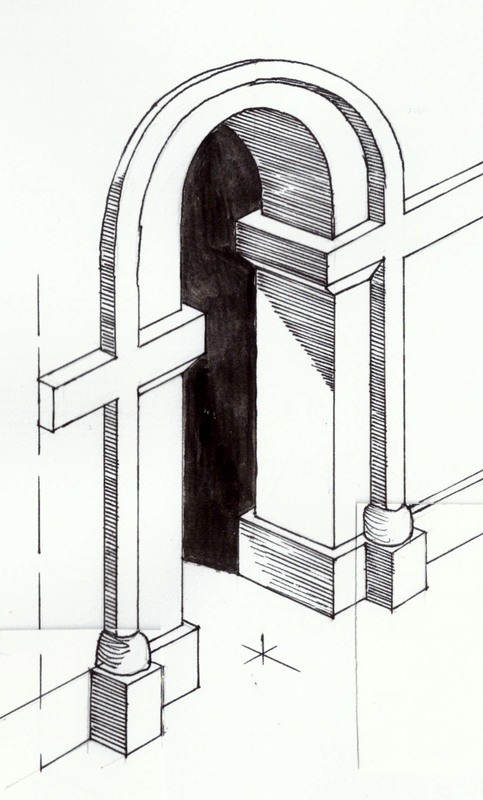 The ink drawing (right) shows how it would have looked when first built and fits the 'model' of a typically treated and presented archway of this date. It seems likely that in Norman times ‘new’ work was confined to possibly raising the height of the pre-conquest nave, inserting new arches to the crossing and possibly re-working those in the nave, and raising the height of the transepts and tower. The stilted (Norman) arches inside the tower, which give access to the transepts, serve to remind us that the Normans were working within the framework of an existing earlier fabric (of unequal dimensions) and that they had to make the best they could within those pre set strictures when refashioning a major and substantially large late Anglo-Saxon building. 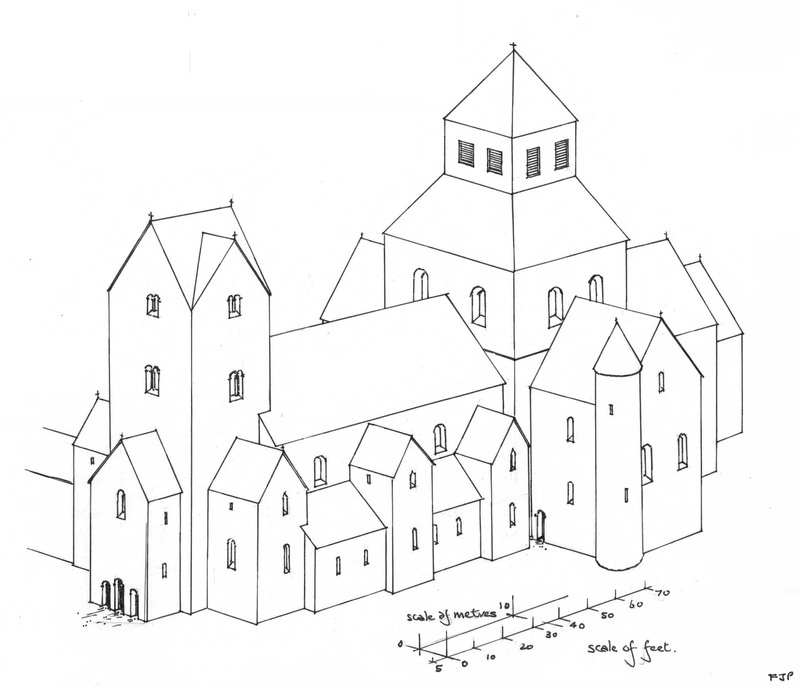 Pictured below right: the Anglo-Saxon Abbey, how it may have looked in the first half of the 11th century (viewed from the SW). Click on the picture for more information. i. R.C.H.M., Dorset, West (London 1952), xlvii. I have drawn heavily on the concise and masterly arguments set out in the volumes "Anglo-Saxon Architecture" by Dr.H.M.Taylor & Joan Taylor. And which see same, vols 2 & 3. This page last added to/revised December 2015.